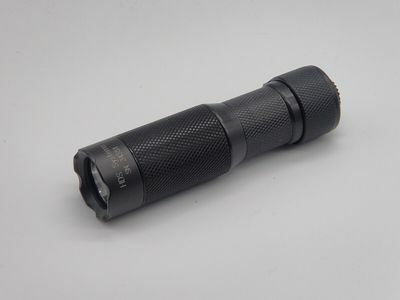 HDS Rotary Tactical 'Law Enforcement' 325 Lumen flashlight. If you're reading this you probably know about HDS. Very nice condition, hardly used, very difficult to find in the UK. New price is about £275. The EDC Tactical 325 lumens flashlight (EDC-T1B-325) combines a rotary control with a single push button for the most advanced tactical flashlight in the world. The fully clockwise position is momentary Maximum. The secondary clockwise position is momentary Tactical Strobe. The counterclockwise position is a rotary adjustable brightness level from bright to dim with a click on/off interface for more utilitarian tasks such as navigating, investigating or paperwork. And the light is conveniently small and light weight so you can carry it with you wherever you go.